Bake: at 420F for 20 min. Total: 2 hrs. 10 min. Nice to have video of the bread recipe …. Can’t wait to try it! Kristyna, good to see you’re back. I was wondering if you’ve seen any cookbooks of a Polish nun named Sister Anastazja Pustelnik (I hear published in the Czech language). I hear they’re rather popular and given the overlap of recipes in slavic countries if any would be considered also Czech? Also, your kindle cookbook is it NOOK-able because that’s what I have. Lastly both you and your husband have trimmed down! whatever your size always a cute couple! Aww, thank you Ann. Yes we did lost a lots of weight. 🙂 Feeling much better now. 🙂 I have never heard about this cookbook. Since we used to be part of Hungarian Austrian empire lots of recipes are similar. Yes, my cookbook is now only available on the Kindle. You actually don’t need a reader to be able to read it. Kindle offers free app. Her cake and pastry recipes are suppose to be very good, and she has about 5 cookbooks out (but not in English). Google her! I have my first ever batch of Rohliky in the oven baking and they smell soooo goooood! Truth be known, they smell and look so good I am thinking about starting another batch right now. We will be eating them for dinner as soon as they’re done with cold ham and chicken and salad. I will try your rohliky tomorrow and let you know how we like them. I remember how good they tasted with a sprinkling of caraway seed. next time will try instant flour. we ate two and from the rest we made cubes for dumplings. Hm, that is strange. Was your yeast still ok and not expired? Hi I am in the process of making Rohliky but the dough seems to be quite tough. What kind of dry yeast do you use? I noticed that in Publix they sell active yeast or rapid rise I am using the active yeast and I hope that you did also thank you. I use just regular active dry yeast. I hope they turned out good for you. I have lived in England for the past 25 years and never been able to bake these- until now!!! Thank you, thank you, thank you for this wonderful recipe. I made 8 last night and making another 8 tonight- my whole family loves them. Wow! That makes me so happy to hear! My husband was very surprised to find me in the kitchen trying to make rohliky! They turned out beautifully and he proceeded to eat 4! I had to take them away before he ate them all! He is Czech and has been asking for them ever since! Sunday dinner tonight is svitchkova (wrong spelling I know!) another happy surprise! Thank you for the wonderful recipes and the time you put in to make them successful! Thank you for great and easy recipe. You can definitely put poppy-seeds or course salt. I will try making these. Do you think I can substitute gluten free flour and use olive oil instead of butter? (Allergies). Same amount? I have not tried it so you might need to experiment. Wishing you success! Try same amount. I was raised in a Czech neighborhood just outside of Chicago. The bakery is in Berwyn, IL. They make the best salty horns. I made your recipe and they turned out great. My goal is to make lighter and not so dense dough. Can you please help me, maybe give me measurements for much lighter dough. By the way I ate 3 of yours while they were still warm with of course butter. Hello Ella, I don’t have another recipe for these. But I would suggest to let them rise longer before you put them into oven. Also make sure your yeast is not expired. Wishing you success! Love your recipes. How can I print them? I am sorry, but for some reason the print option disappeared. But I am writing printed cookbook which hopefully will be done soon. Hi Kristyna! I have made Rohlikys a few times and now I get to make them for our Thanksgiving family gathering. I will most likely need to triple the recipe. 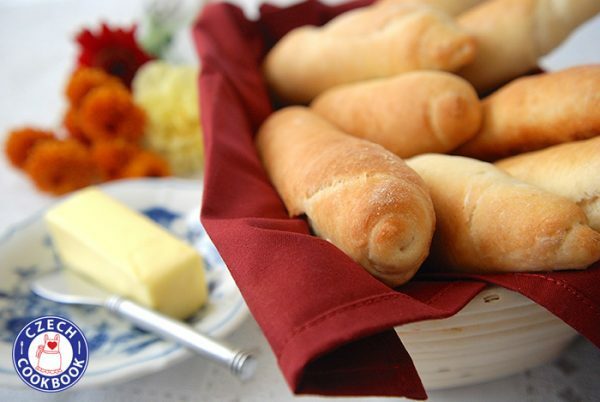 Do you have any hints to keep the dough from puffing up to much before I roll the breadsticks out? Can I keep it in the fridge and then let it wake up before baking as, I am not the quickest at rolling them out. How about storing it overnight in the fridge? Any thoughts or suggestions are greatly appreciated! Thank you in advance. Hi Michelle! I love your last name! 🙂 Wow, that will lots of rohliky, but who could resist! 🙂 So nice of you to make them for such a special day! After it is done rising I would put the dough into a fridge which will slow down the rising process. Do you mean to store the dough out or made rohliky overnight? Hi Eva, I am making my own Tvaroh. Recipe on my website. It sells here as farmer’s cheese but it is hard for me to find. Mine turned out a little tough. Any thoughts? Did I not knead it enough? Or let it rise long enough? expired or if you used too hot water which would kill the yeast. Or the house might have been too cold for them to rise. I hope it is better next time. Pamatuju rohliky kerej pekla moja stařenka. Našel sem vaš receipt. Pekal sem ty rohliky. Ale člověčce, to to bylo zŕadlo! Sú vyborné! Mockrat r děkuju. Kristynko, pred chvili jsem vytahla z trouby rohliky, ktere jsem delala poprve v zivote a podle vaseho receptu. S testem se pracovalo vyborne, teplotu budu muset asi snizit, protoze se mi ze spodu trosku pripekly (mozna moc tenky plech jsem mela) ale hned jsem 2 snedla! jsou vyborne! Predevcirem jsem pekla vase Jidasky, ale tam se mi tak nedarilo. Asi jsem dala malo mouky do testa. ty uzliky jsem mela takove roztekle a hrbolate oproti vam, ale priste to bude urcite lepsi. Dekuji vam za recepty! Moc dekuji za hezka slova. To jsem rada, ze rohliky se povedly! 🙂 Mozna to testo na jidase nebylo az tak dobre zpracovane? Nebo malo mouky pokud se roztekly. Priste to bude urcite lepsi. 🙂 Drzim palce! Kristýnko, děkujeme z Fort Mill, SC jsem tu rok a tak mooooc mi chybí rohlíky;) o víkendu jsem jedny zkusila upéct , ještě jim něco chybělo. Tyhle budou jistě lepší. Díky video moc pomohlo . Nádherné fotky na webu, perfektně zpracované recepty! Díky moc!!! Where are the instructions to the recipe? Instructions are in the video. I am finishing my first printed cookbook where there will be instructions. Yes I always use same yeast active dry. Bread flour should work fine. I am not sure what Hungarian flour is. I’m following you and your recipes in Australia, but I need the recipes in metric please. Hi Ludmila, I create my recipes in imperial system. But for my hardcover book I also created them in metric. My next batch of my books is being printed and I will have them also ship to amazon.au if you are interested. Ahoj, tak rohlíky jsou výborné! Jestliže jste to zkusila připravit večer a upéct ráno? Zkusím to právě teď. Uvidíme! Doufám ze se povedly! Můžou kynout zakryté v lednici přes noc.